Most orders over $50 qualify for Free Shipping! Buckmans.com believes in making your online shopping experience as easy as possible. That's why we offer FREE economy shipping on most single purchases totaling $50 or more! Click here to view our shipping policies and exceptions. Systematic storm-proofing with 2-in-1 versatility for when you don't know what the weather will bring. The life of a mitt is not easy. 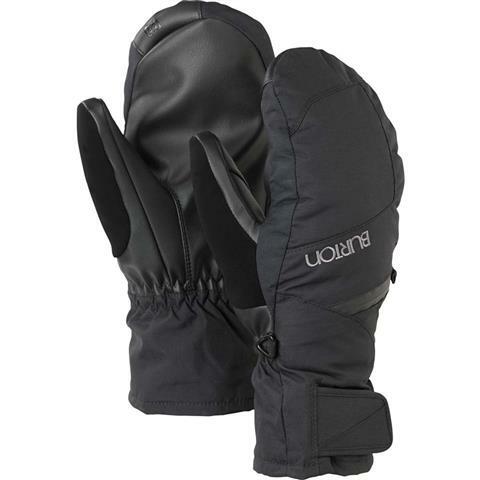 More than any other part of your riding kit, mitts have the most contact with the elements. With that in mind, the Burton team chooses the bestselling women’s Burton GORE-TEX® Under Mitt. DRYRIDE Durashell™ 2L fabric, and a GUARANTEED TO KEEP YOU DRY® GORE-TEX® membrane protect this Thermacore™ insulated mitt from burly conditions. Screen Grab® synthetic leather gives you full coverage touchscreen control using tech that will never fray, wear out, or wash off. A removable four-way stretch fleece liner dries quickly and gives you options for any weather. Wear just the liner when shoveling, just the shell in sloppy spring conditions, or combine the two for total midwinter warmth and comfort. Great Mitt @ Great Price! Pros: Gore, Comfy, "Great Bang for your Buck!" Goretex mitts for under $65! The undermitt comes up just high enough to lock out any unwanted moisture and tucks nicely under your jacket sleeves. Love these mittens! They keep my hands super warm and they allow you to access your phone when wearing. They truly are the best! Sign up for exclusive deals, coupons and events! Be sure to follow us throughout the world of social media! Copyright © 2008-2019 Buckman's Ski Shops, All Rights Reserved.